Hello friends! I know it has been pretty quiet over here on my little slice of the internet lately but that is changing pretty soon! I will be catching up on nearly 9 months worth of blogs! HOLY COW right?? To kick off this 2019 wedding season, I am starting with Missy & Sean! 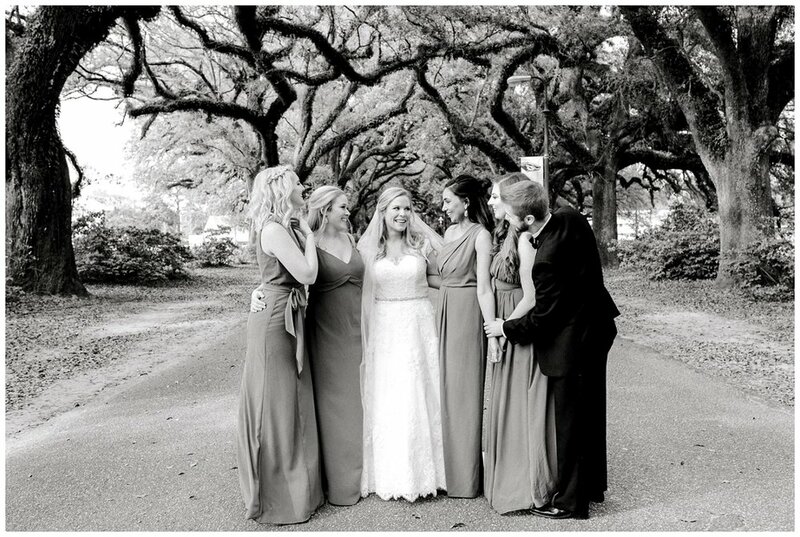 I absolutely loved being able to get to know Missy & Sean & their families on their wedding day! They were all so sweet and Missy has the most beautiful spirit about her. The day started with the bridal party eating some lunch, sipping on champagne, and getting prepped for the wedding at The Admiral Hotel in Downtown Mobile, Alabama. My second shooter, Sarah, & started photographing Missy’s details and let me tell you- the couple’s wedding bands were the sweetest ever. They were inscribed with the verse from Song of Solomon that says “Set me as a seal” and I legitimately almost cried when I noticed it because it is one of my favorite verses (and songs!) of all time. 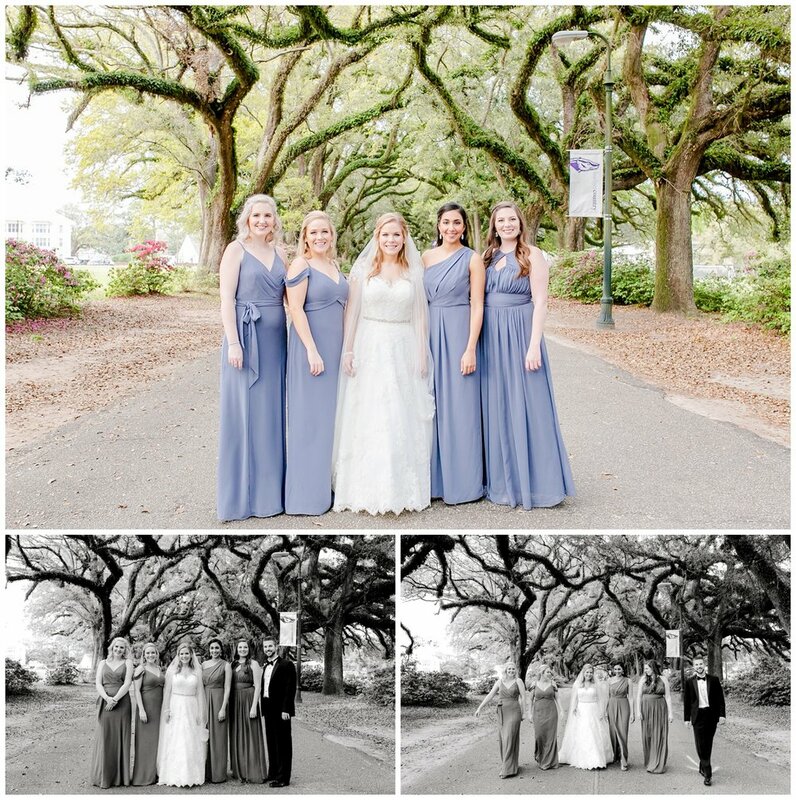 We left the hotel and made our way out to The Avenue of The Oaks at Spring Hill College. If you are local and haven’t ever gotten to go out to the college campus, you are really missing out. This is hands down one of the most beautiful locations in our area and I love getting to photograph weddings there! 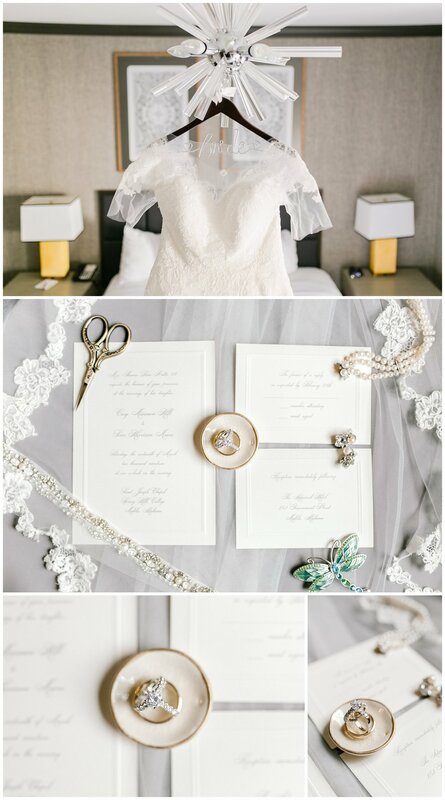 Missy and Sean opted to skip the first look and keep things traditional so we photographed Missy’s bridal party, her bridal portraits, & her family photos first. We got Missy & the bridal party hidden on the Trolley as the groomsmen and Sean arrived. 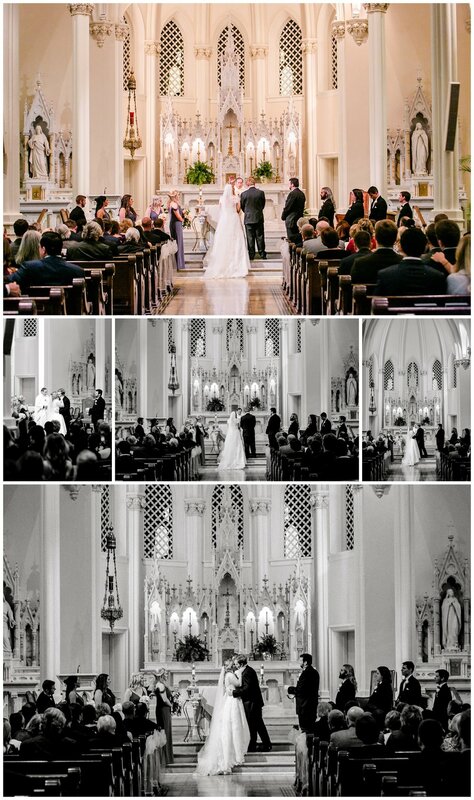 The ceremony was held at Saint Joseph’s Chapel on the Spring Hill campus right at 6pm. It was a traditional Catholic ceremony with Mass. 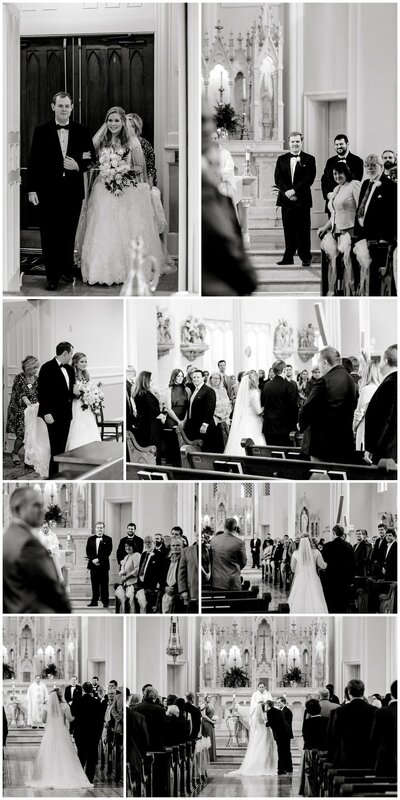 These ceremonies are filled with angelic hymns, powerful statements of faith, and the recognition of sacrificial love & they are some of my favorite ceremonies to be a part of. The sun was setting right as the ceremony was over and we went immediately into couple’s portraits & wedding portraits to take advantage of the fleeting golden light as the sun was sinking behind the oaks. Sarah & I followed the trolley which was filled with the wedding party back to The Admiral Hotel to get the party started and celebrate! They used the second floor’s ballroom and had it decorated with beautiful candles and greenery & the ambient light shining in the darkness was so warm and elegant. Missy & Sean went straight into their first dances and if I am being totally honest, I cried. Like- multiple times. I am so honored to have been witness to this couple starting their new journey as husband and wife and I am so looking forward to getting to experience even more life changing moments with them and their families again in the future! Cheers to you, Missy & Sean!